In Iceland, where it was frigid every single day we were there (not that I was expecting any different), I probably had soup at least twice a day. Those Icelanders, man, they really know what they’re doing in that department! Below, the highlights of my soup-centric week. 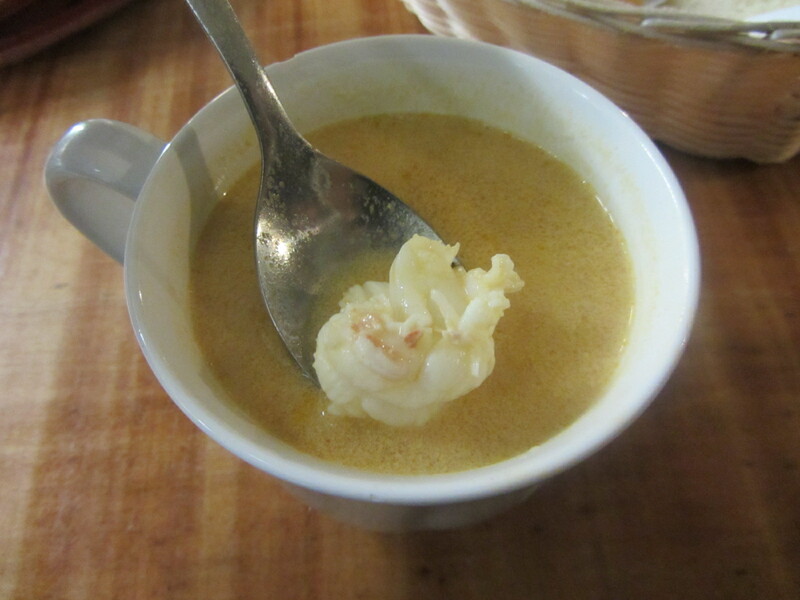 At the top of my things-I-MUST-eat-in-Iceland list was the humarsupa, or lobster soup, at Saegreifinn. The tiny restaurant/fish shack in Reykjavik’s old harbor was supposed to have some of the best lobster soup in town, so the first night we were there, my sister and I made it a point to have it. 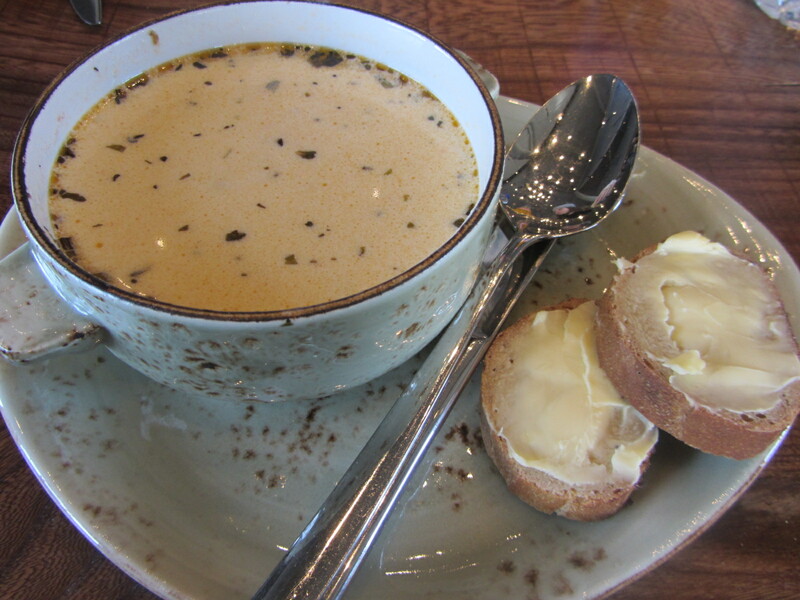 I can’t say I tried lots of other lobster soups, but I didn’t need to because this one won my vote. Sweet and velvety without being cream-heavy or goopy, it had just the right amount of fat hunks of sweet lobster meat. My only regret: not going back for more every single day. During a visit to the Friðheimar greenhouse, we learned about how the nice folks there grow beautiful, fat, pesticide-free, organic tomatoes. 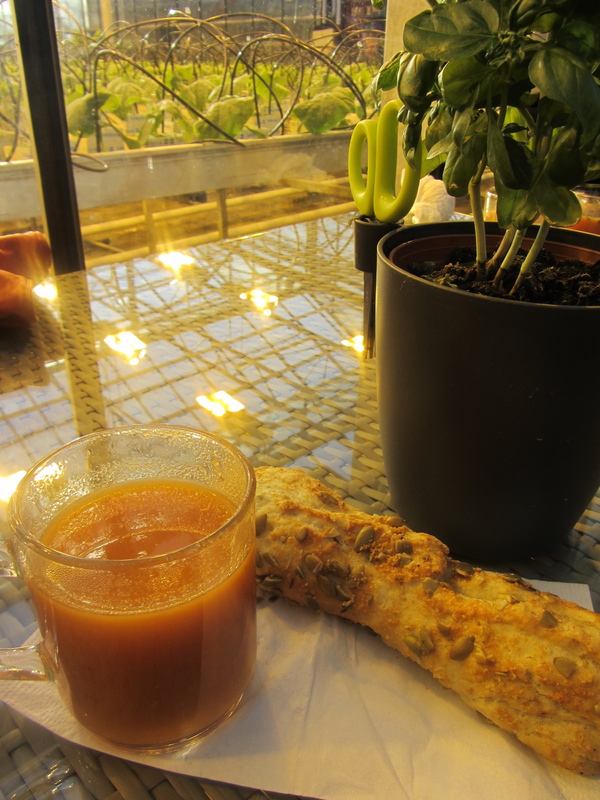 And while learning about that process was interesting and inspiring, far and away my favorite part was getting to drink some of the tomato soup made from the tomatoes grown just a few feet away. Unlike the heavy, pasta sauce like tomato soups I’ve had at home, this one was lighter, brighter and sweeter. Add a warm piece of garlicky, pumpkin seed-flecked bread and fresh herbs (that you could snip for yourself right at the table!) and it doesn’t get better than this. 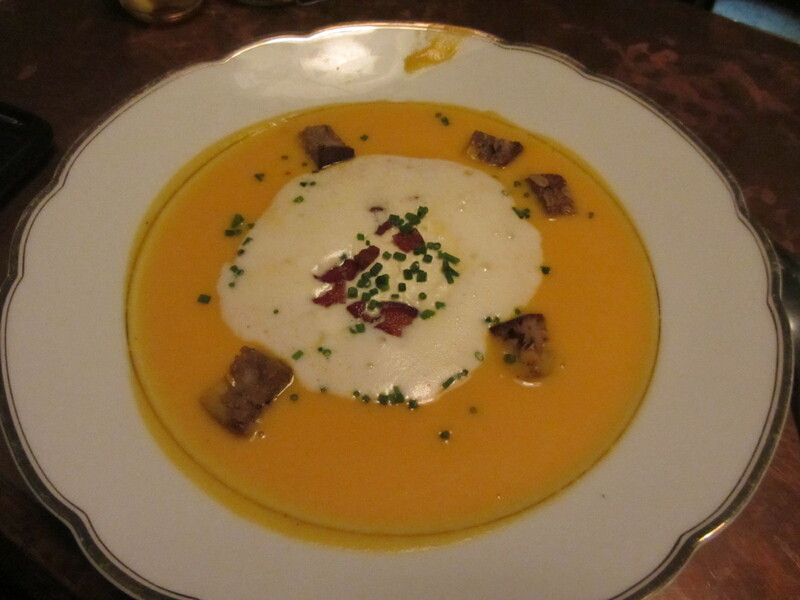 One of the things I loved about Kex, where we stayed, was the awesome food they served at Sæmundur, the hostel’s hipster gastropub where I had this creamy, thick butternut squash soup with cream and bacon chunks. Really, it doesn’t get more comforting than this soup. This soup would be perfect for Thanksgiving or really any other day in fall or winter (or spring or summer if you crank up the AC the way I like to). Finally, one of the best meals I had in Iceland was at perhaps my favorite place visited in the country, the mind-blowingly beautiful, ridiculously awesome geothermal spa, the Blue Lagoon. 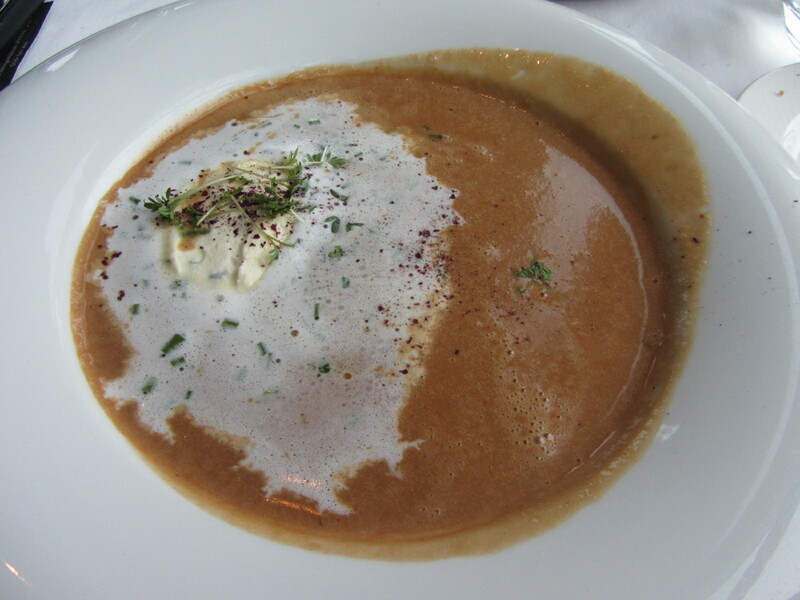 I had a really phenomenal three course lunch at LAVA, the spa’s sit-down restaurant, but my favorite part was the seafood soup appetizer, a rich soup made with shrimp and lobster (which in Iceland is really more of a langoustine and less like the fat lobsters we know in the States) in a buttery, perfectly spiced cream base. This entry was posted in Dinner, Lunch and tagged bacon, Blue Lagoon, butternut squash soup, fish soup, Friðheimar greenhouse, Iceland, icelandic food, Kex Hostel, langoustine, LAVA, lobster, Saegreifinn, Sæmundur, seafood, shrimp, soup, tomato soup. Bookmark the permalink.